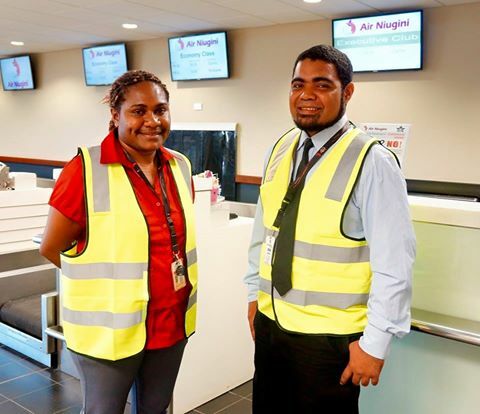 Two cadets attached with Air Niugini’s Ground Operations Department have successfully completed their two year internship program and are now ready to take on their new roles. Nancy Harris and Lionel Kup were recruited under the airline’s graduate management program following the completion of their bachelor programs at the University of Papua New Guinea(UPNG) and the PNG University of Technology(UNITECH) respectively. Since their recruitment two years ago, Nancy and Lionel were attached to various sections within ANG’s Ground Operations and other key departments including Finance, Human Resources, Marketing, Cargo and Aviation Security where had the opportunity to gain skills and knowledge and understand the core functions of each department and how they inter-relate to Ground Operations Department. Such experience has broadened their understanding of the airline industry in general. Now that they have completed their cadetship, Nancy will be attached with the Load Control office whilst Lionel will be working with the airline’s project team. Under the Graduate Cadet program, Air Niugini hopes to have a pool of highly trained young people who are capable of taking more senior roles and responsibilities and gradually move up to take managerial positions within the airline.